recipe from Emeril, with just a few changes: he made his with crispy potato cakes, which we weren’t interested in on this particular go-around, though I think they would be delicious. I also omitted the parsley garnish and the nutmeg from the spinach, and we don’t have white pepper – just minor things. Prepare the Sauteed Spinach and Mornay Sauce and keep warm in the oven while you prepare the remaining components. To poach the eggs: break the eggs into individual saucers or cups. Fill a medium skillet halfway with water. Add the vinegar and salt and bring to a boil. Pour eggs into water, cover the skillet and remove from the heat. Allow to sit 4 to 5 minutes. When the eggs are ready, divide the potato cakes evenly between 2 dinner plates and top each with some of the creamed spinach. Remove the eggs from the skillet with a slotted spoon and gently place on top of the spinach. Season with salt and freshly ground black pepper, to taste. 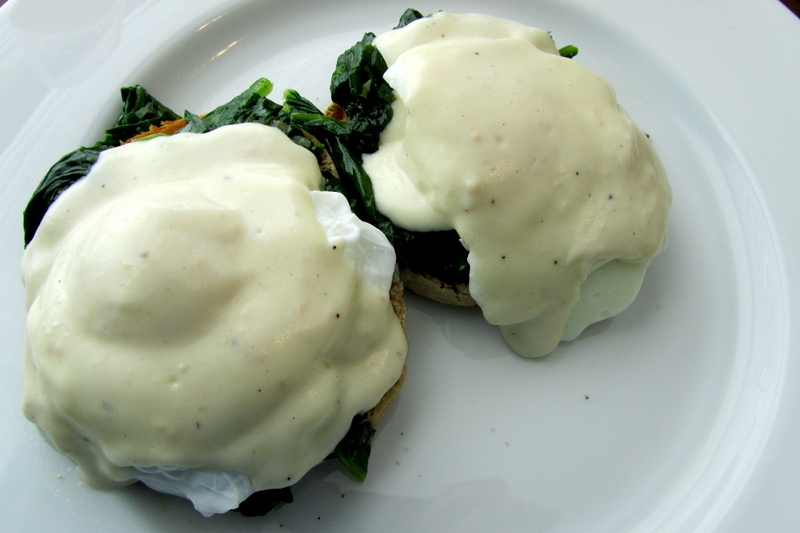 Ladle some of the Mornay Sauce over the eggs and spinach and serve. Melt the butter in a large skillet over medium-high heat. Add the shallots and saute for 1 minute. Add the spinach and saute, stirring to wilt and combine with the shallots. Season with salt and freshly ground pepper and a pinch freshly ground nutmeg, to taste. In a small saucepan melt the butter over medium-high heat. Add the flour and cook, stirring constantly, until the roux is pale yellow and frothy, about 1 minute. Do not allow the roux to brown. Slowly whisk in the milk and continue to whisk until the sauce thickens and comes to a boil, about 2 to 3 minutes. Reduce the heat to a simmer and season with the salt, pepper and nutmeg. Allow to simmer for 2 to 3 minutes. Stir in the cheese and whisk until melted. If the sauce seems too thick, thin with a little milk. Use sauce immediately or refrigerate, surface covered with plastic wrap, for several days in the refrigerator. 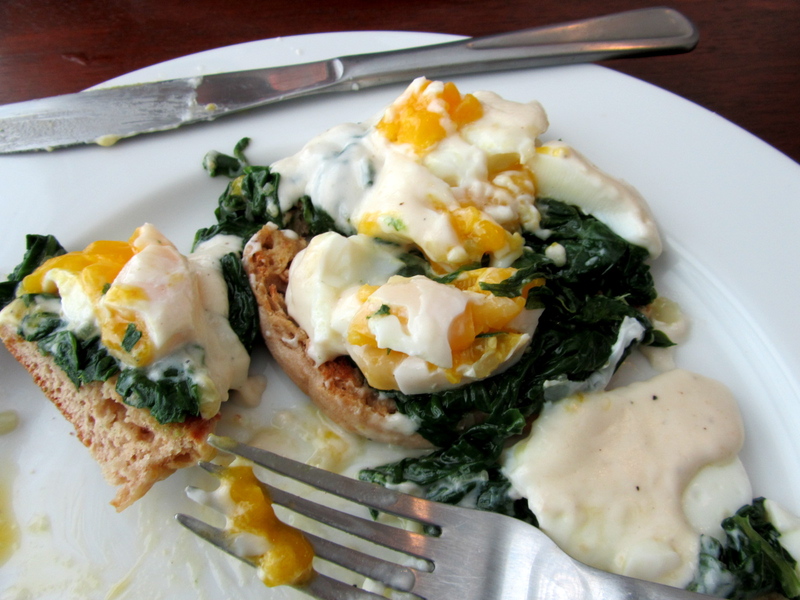 This entry was posted in breakfast, vegetarian and tagged brunch, eggs, eggs florentine by Laura Zolnoski. Bookmark the permalink.